Looking to pick up some silver flatware in the next few months or years? Silver flatware if you can afford it is a great long term investment for your family. It may not make sense financially 100% but in terms of family heirlooms a set of silver flatware (forks, spoons, knives etc) ranks right up their with the living room clock, or moms ring. 1 – Silver Content If the pieces or the set you’re looking at isn’t marked “Sterling” or “925” or even “.925″ then you’re probably looking at a silver plated or silver inlaid flatware set. Sterling silver (aka 925 or .925) is 92.5% silver and 7.5% other metals such as copper which makes the utensils more durable. See examples of sterling silver marks here. 2 – Which Pieces Will Be “Solid” When weighing and valuing silver flatware, the “butter” knives, forks, spoons and some specialty items will be Sterling and should be marked as such. However, items some knives, serving utensils, salt and pepper shakers and candle sticks will contain such things as sand, concrete, steel or other metals for balance and added weight. The rule of thumb is to weigh these separately and assume these items only contain 25% silver. 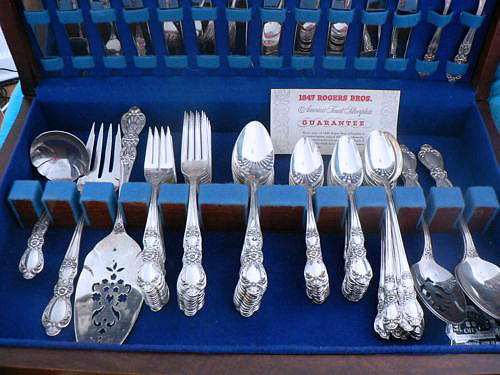 3 – Condition If you’re looking at silver flatware for the silver content, condition is a negligible concern. Silver weight is silver weight and pieces with bends, dents or even tarnish aren’t going to affect the value of the silver. 4 – High Value Flatware When looking for silver flatware as a collectable, you’re looking at more than the silver weight. Brands and hallmarks will play a very important part in your search for rare and expensive flatware. As an example, the French maker, Christofle, is a highly respected maker of sterling silver and even silver plated flatware which commands a premium price. This premium is sometimes hundreds, even thousands, of times the silver weight value. Silver is silver and most flatware is exactly that. If you’re looking for a useful and functional way to make a silver investment, buying silver flatware isn’t a bad way to do it at all. 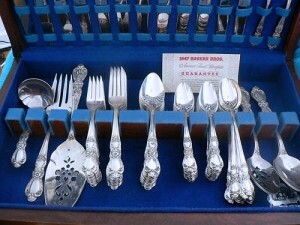 However, if you’re looking to make a true investment in silver flatware, the collectable sets are the way to go.